Every year, more than a million muslims make the Hajj Major Pilgrimage in Mecca, Saudi Arabia. The faithful come from the most remote corners of the world and they are of all ages and social classes. In this article, we will tell you about the origins and why it is so important to muslims to make such pilgrimage. We will venture in the most significant part of their beliefs and we will tell you everything about Hajja Major Pilgrimage. Muslim religion is based on five pillars, which represent the fundamental and mandatory precepts for all muslims. Such pillars are the profession of faith, prayer, alms, fast and in the fifth place it is pilgrimage to Mecca. Hajj Major Pilgrimage is the fifth pillar of Islam and it is mandatory at least once in a lifetime for every muslim who has no disability at all and who can afford such pilgrimage. So important is making it that each person who has made it is recognized by having the prefix ‘pilgrim’ in Arab before their name and by making sound a long ‘a’, as a proof that such person deserves more respect and recognition for having met the fifth pillar of Islam. The pilgrimage takes place during the month of Dhu al-Hijjah, twelfth in the muslim calendar and some variations occur in the pilgrimage depending on the place of residence, whether it is in Mecca or whether it is abroad. First Day: eighth day of Dhu al-Hijjah, the intention of making the pilgrimage is shown through a formula which is repeated three times and that consists of, after entering irhaam, or sacralization, going around Kaaba seven times and kissing the black stone. Next, the tour between Safa and Marwa is done seven times, which represents the moment in which Agar was searching water for her son Ismael. After that, water from the well of ZamZam is drunk. Finally, the pilgrim goes to Mina, which is 4 kilometers from the city to recite the noon, the sunset and the sunrise prayers. Second Day: ninth day of Dhu al-Hijjah. Mount Arafat is visited in the morning and the noon and afternoon prayers are recited. The pilgrim stays there until sunset, moment in which Muhammad pronounced his farewell speech. When the sun sets it is the moment of going to Muzdalifa to recite the evening prayers. In that place, the pilgrims pick up stones to use on the following day. Third Day: tenth day of Dhu al-Hijjah, after the morning prayer, the pilgrim goes back to Mina. This day it is the Feast of Sacrifice (Aid al-Kabir). In the route there are three pillars which represent the three attempts made by the devil to discourage Abraham. 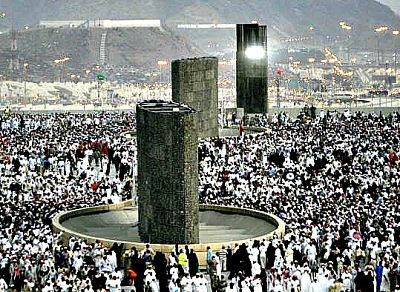 What the pilgrim has to do is the rite known as The Stoning of the Devil in which the pillars are stoned with the stones picked up the previous day. The rited is completed with the sacrifice of a lamb, which represents the sacrifice of the same animal that Abraham held in substitution of his own son. Back in the mosque, the circumvallations and tours of the first day are repeated and to finish with the pilgrimage, a last farewell circumvallation is done and the state of irhaam is abandoned, whereupon men have their heads shaved and women had their hair cut. How did Hajj Major Pilgrimage start? The first pilgrimage to Mecca dates back to the year 628 and its aim was to restore prophet Abraham’s religious traditions, since the moral values of that city had decayed and the situation was really bad. It counted with 1,400 men and was led by Muhammad. According to the muslim tradition, 4,000 years ago, Abraham received instructions of travelling to Arabia with Hajira, his second wife and his son Ismael, so that they could escape from the jealousy and rage of Sara, his first wife. Once in the place, Allah asked Abraham to leave his wife and son with a bit of food and water. However, they were soon run out of food and water and Hajira had to climb Safa and Marwa hills to find more of them, as well as help for her son and herself. Almost fainted, the desperate mother asked Allah for help and it was then when Ismael introduced his foot in the sand and water started to emerge making both of them save their lives. That was how mother and son managed to survive exchanging water to nomads by food. The place is nowadays known as the well of ZamZam.